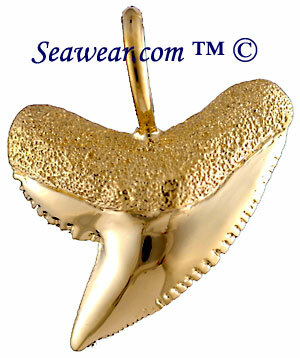 The three most dangerous man-eating sharks in the world are the Great White, Hammerhead, and Bull Sharks. 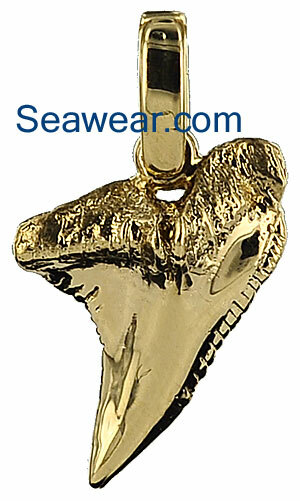 All three have awesome teeth and all are found in Florida's Gulf waters in astounding numbers and size. Some of the best areas in the world for finding sharks teeth are the beaches of west Florida. 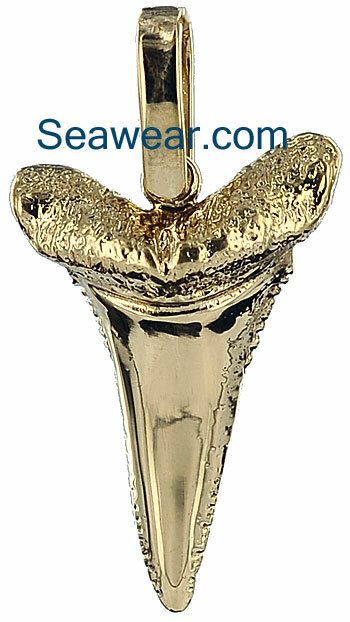 Solid gold or platinum great white shart tooth pendant cast from an actual tooth of a great white shark who left this one where he shouldn't have. 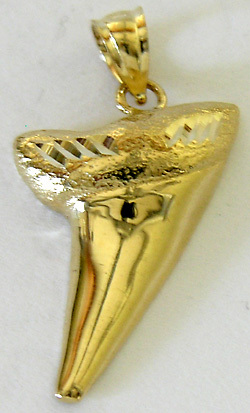 14kt solid gold great white shark tooth! Finished on all sides, serrated like a spiderco! Over 1.25" H by 1" W by 1/4" D! Heavy. 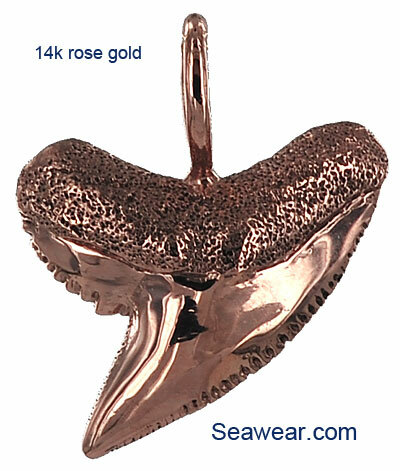 If you are a dive master, dive tour operator or boat captain, this will be noticed. Large size mako shark tooth. 1 7/16" or 36mm long on the longst side where the bail is. 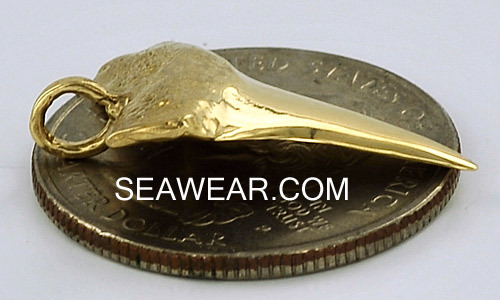 With bail it is 1.75" of solid thick heavy gold! Massive root tube structure. 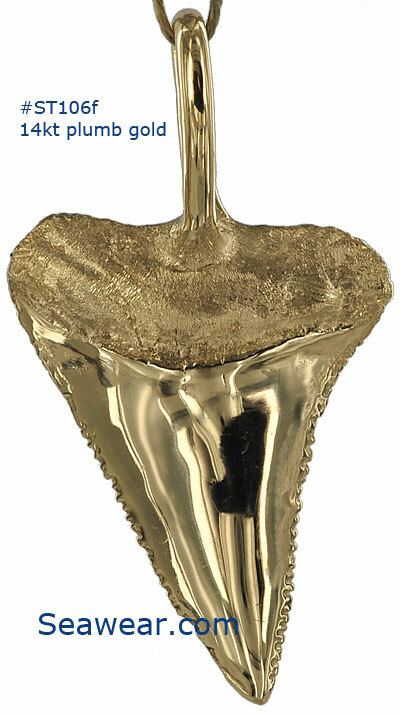 Crown is highly polished while root has been done in contrasting satin diamond sparkle. Heavy bail is app 2mm thick and will not give. Soldered closed and swivels. 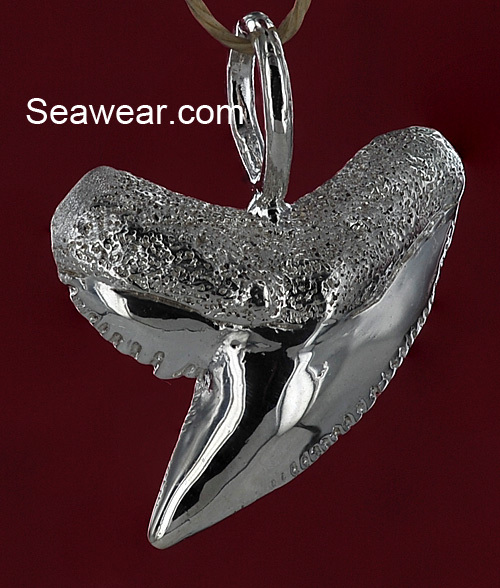 This is 15gms and requires a strong jewelry necklace chain! 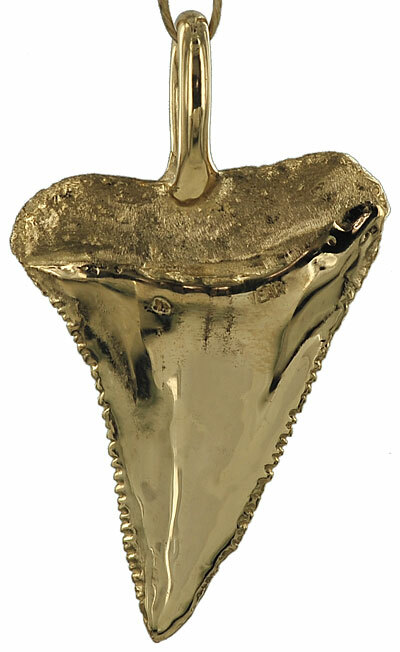 Tiger shark tooth from a sixteen foot tigershark. 1 3/16" along the edge 1 1/4" top to bottom with the bail or 33mm. 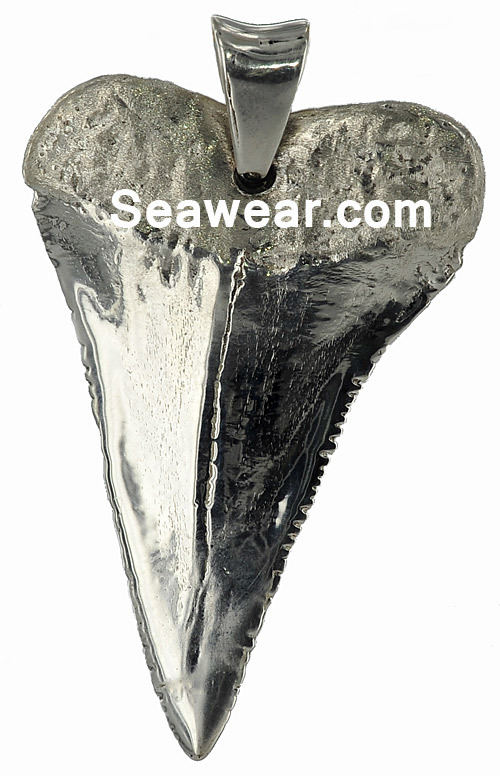 Bail is solid heavy gauge and cast as part of the tooth. App 15-16gms and requires solid heavy chain. Bail opening 5x6mm All serrations intact. 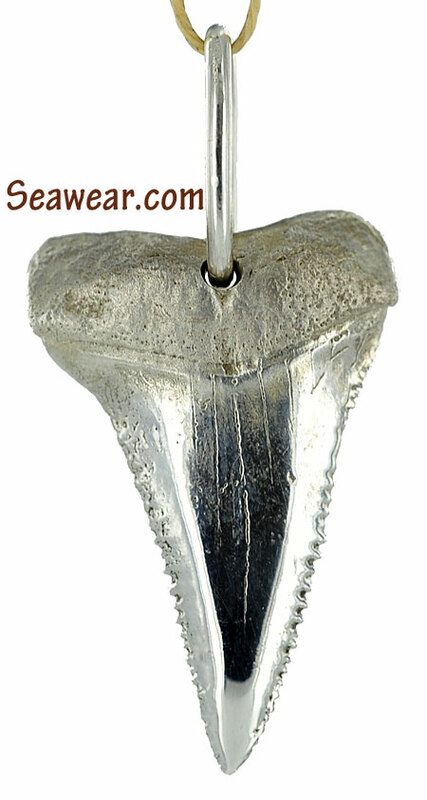 Medium sized great white shark tooth. 1 1/4" tall not including the fixed bail. Hightly polished both sides, satin textured gum and feeding hole. App 13.2gms of come and get me sharky! 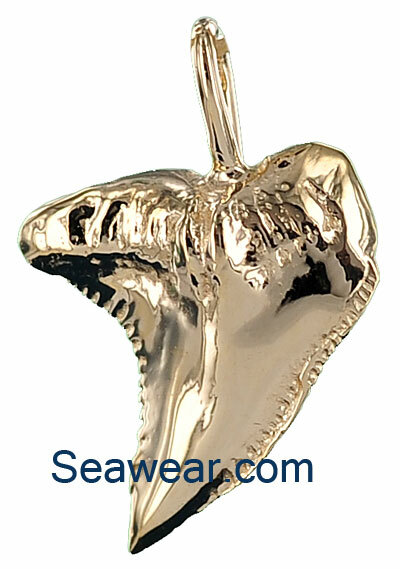 This shark tooth pendant is for tearing once the others have bitten! 1 1/8" or 28mm plus the oversided pivoting bail which will accomadate a 2-5mm chain. 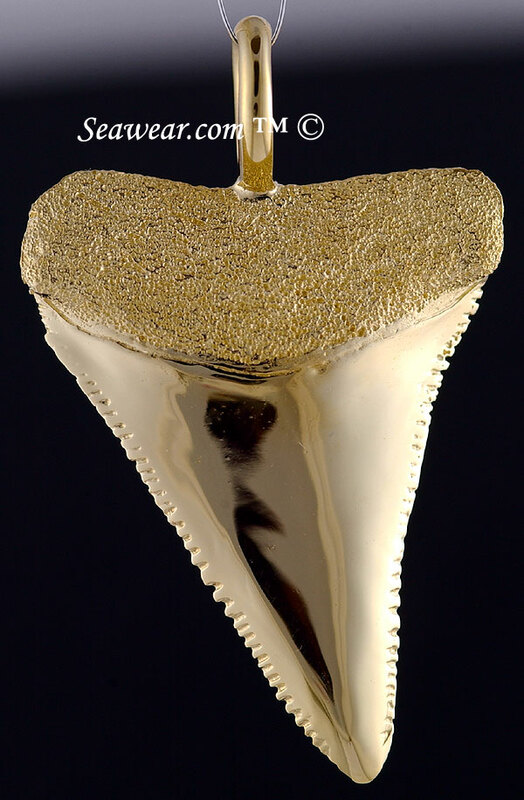 App 7.6gms full round 3D shark tooth. Small great white shark tooth in full round, three dimention. 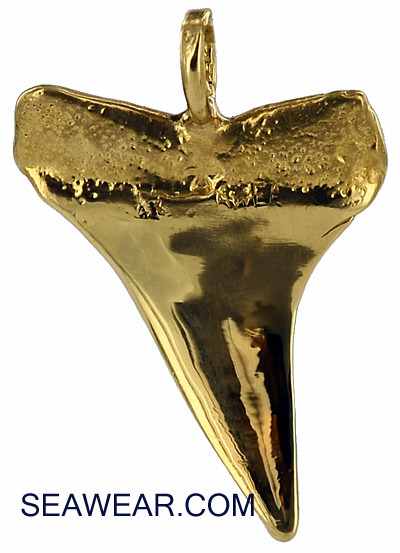 Solid, not hollow or scooped out on the back side. Tip to right hand gum line is just under 1" or 34mm. Tip to top of fixed bail is 1" or 35mm. 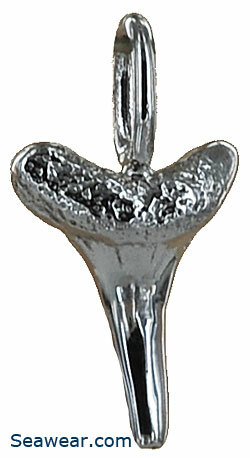 1/8" thick at gum or 3.5mm. 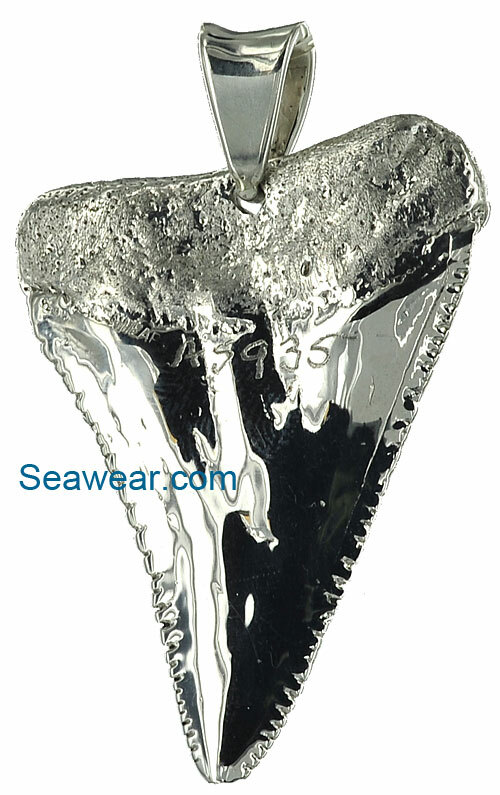 Bail is ideal for 1.5 to 2mm chain. 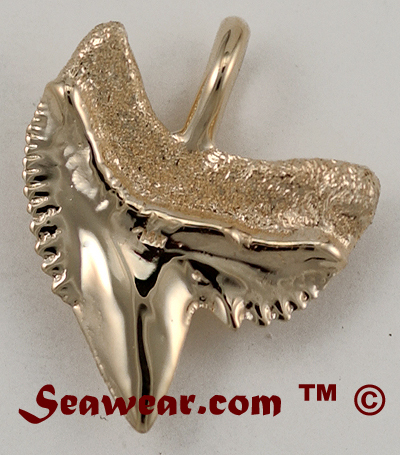 App 4.5gms High polished enamel and soft satin finished gum area. 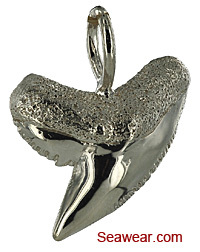 This one is scary hanging on a chain, let alone thinking about rows and rows of them coming at you! 7/8" tall and across. Full round 3D Tiger Shark tooth. 13/16" or 20mm plus bail. App 3.3grms. Finished on all sides. 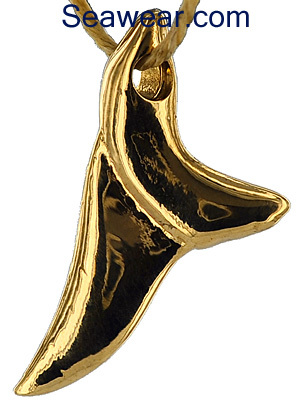 Small shark tooth for necklace or charm bracelet. 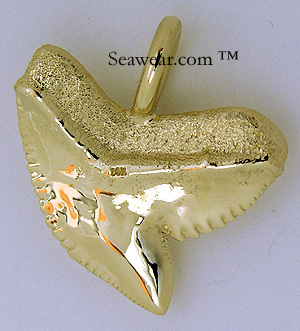 The opening is for a jump ring for your bracelet or a very small chain. 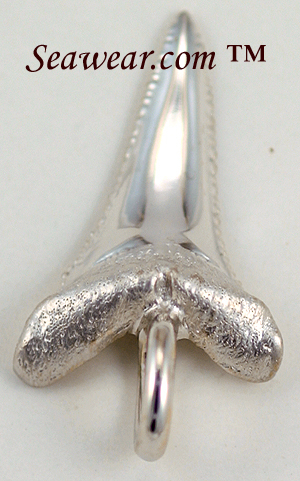 The opening is only 2mm so requires a very small chain end. 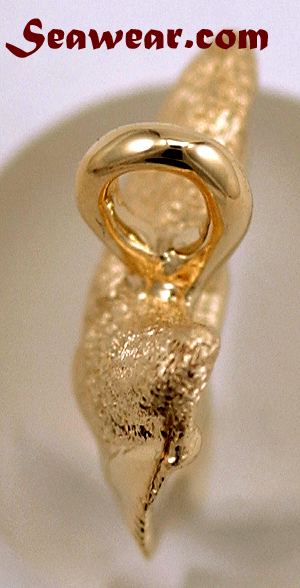 App 2.4gms, highly polished or satin on the gum portion. 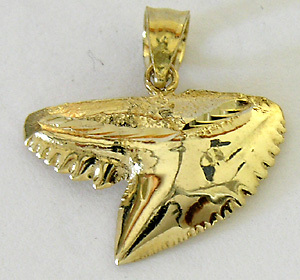 Shown in natural 14kt, also white, rose, green golds or platinum. 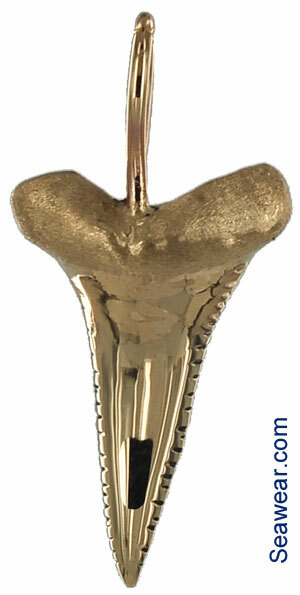 It measures 15/16" or 23mm on the longest side and 9/16" or 14mm across the top. 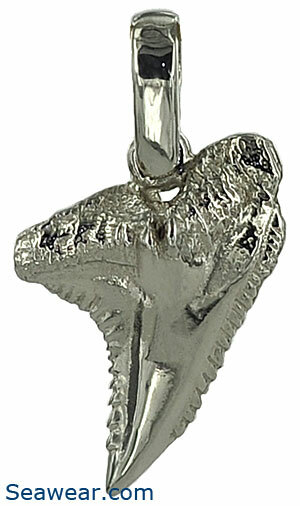 Thickness is only 2mm so is great for your finest chain or dangle earrings. 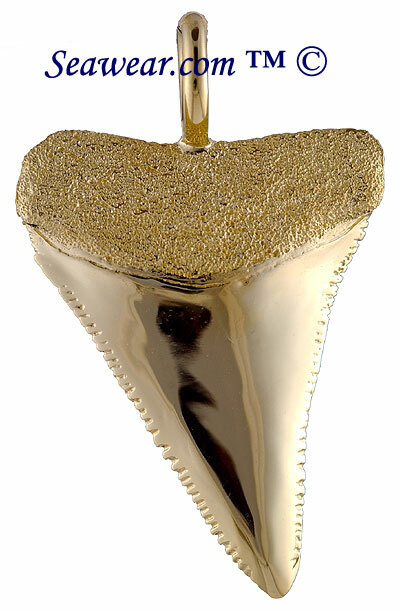 So realistic a gold shark tooth, your friends will wonder if it's capped! One sided for light weight. One inch tall. 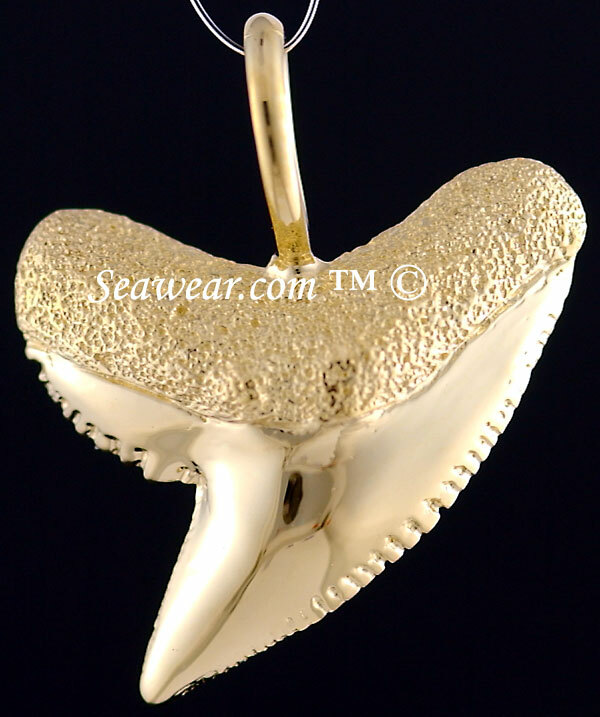 3D 14kt gold tiger or upper dusky shark tooth with serrated edges all around! 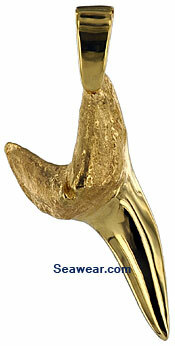 The tooth base has a texture finish while the biting part is smooth as bone! About 1/2" across. 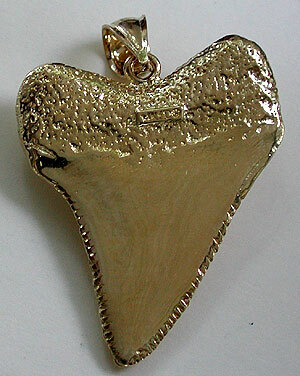 14kt one sided upper dusky gold tiger shark tooth. 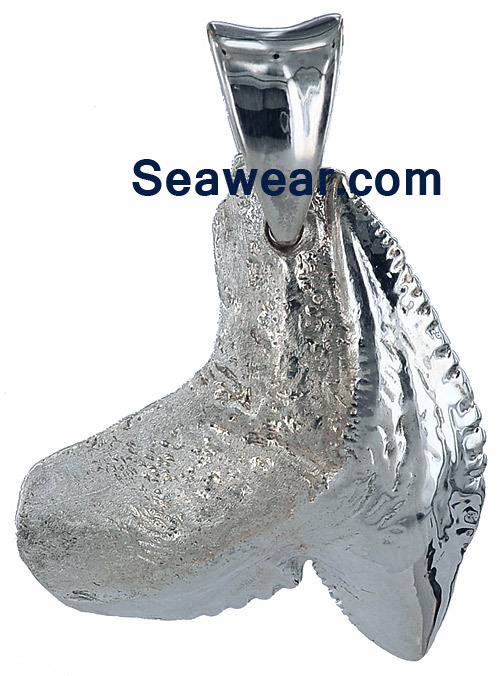 Is larger than above, but lighter with the curved shape. Almost 7/8" across with serrations on leading edges! If you have ever been to Venice Beach FL you know how exciting it is to find these! Small shark tooth with built in bail for your lightest chain. 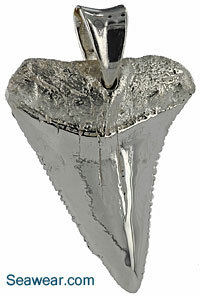 App 1.2gms, high polish, 11/16" or 17mm tall with bail. 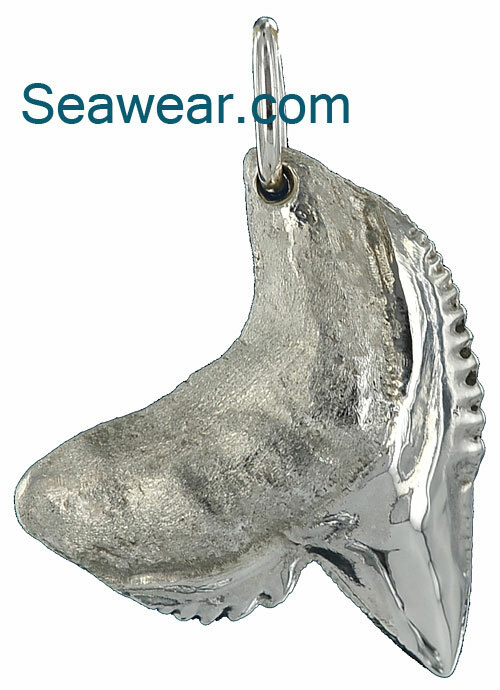 Even work great on existing shepherd hook earrings! 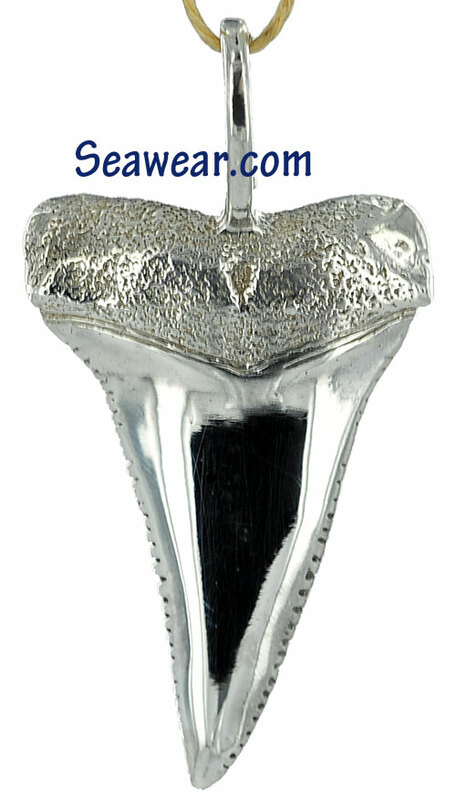 Argentium 935 sterling silver very large great white shark tooth pendant. 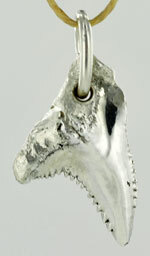 App 39.6gms and just over 2" long or 52mm along the left hand side. 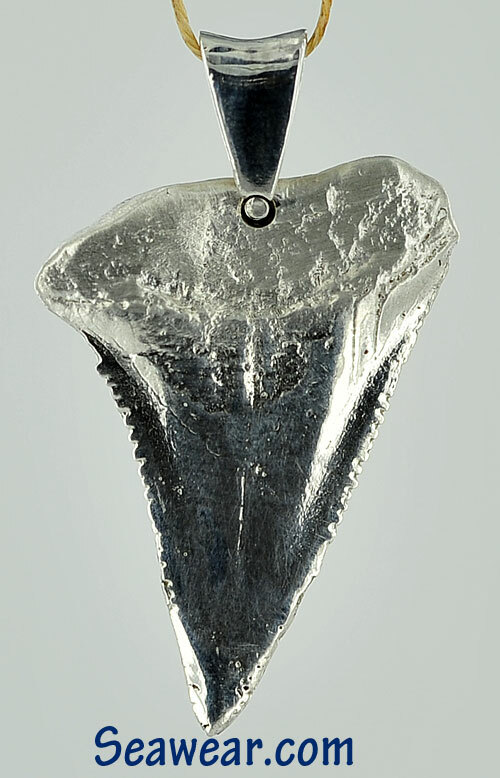 This great white shark tooth was molded from an actual fossil and shown here on a standard sized business card. Most natural age cracks and lines are visible. We can polish everything smooth, but try to keep them looking as much as the original as possible. The root is just over 1/4" thick. 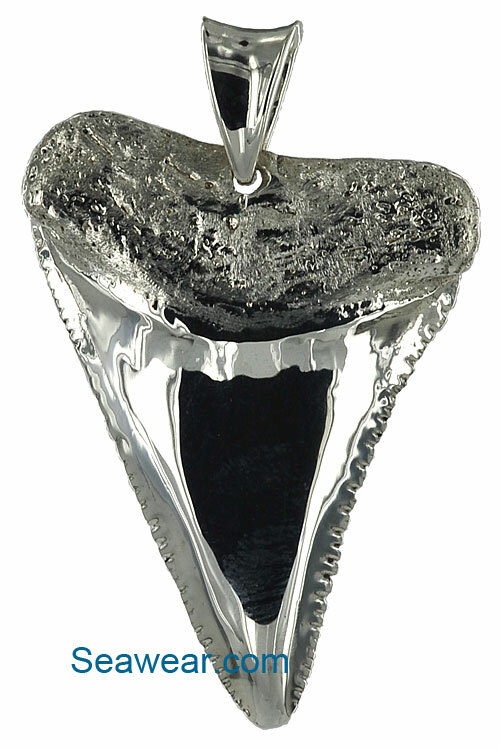 The enamel is polished smooth and the gum root has a satin diamond finish that sparkles and refracts light back into itself. 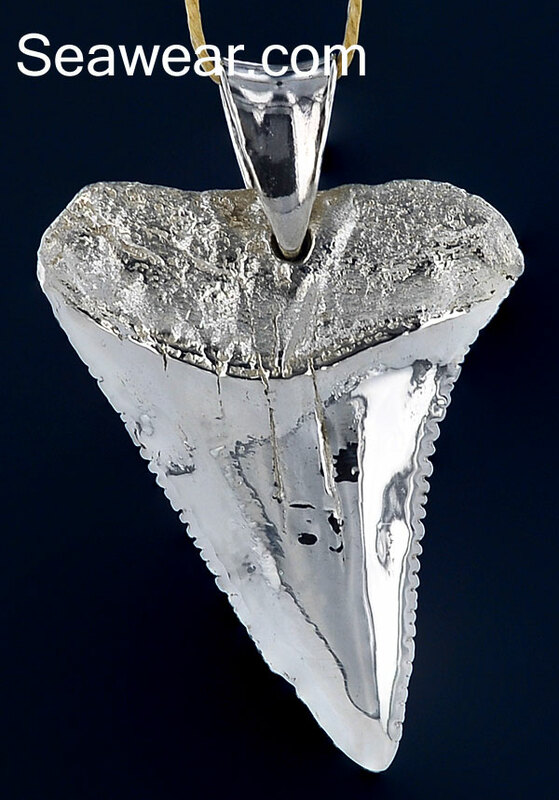 Great white shark tooth done in Argentium silver, solid full round 3D. This one weighs in at 35.1 grams. Over an ounce! You need a solid chain! 1/4" thick at the gum, 1 15/16" long and 2 1/8" hanging length with the bail. 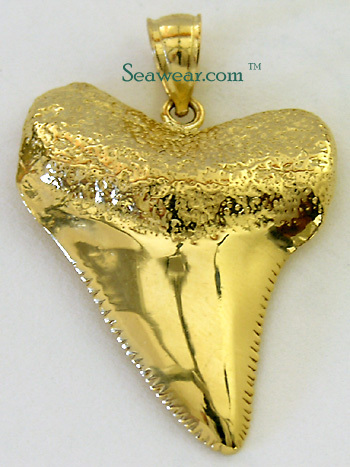 Molded from actual antique shark tooth. No shark was harmed in the making. Highly polished with the gum root being textured after polish. 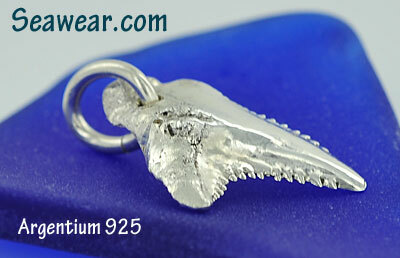 Argentium 935 silver large tiger shark tooth. App 17gms and just over 1.25" or 32mm along the right hand side. 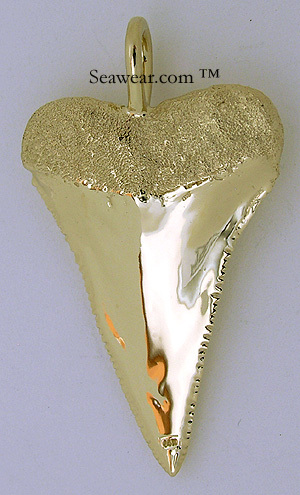 Enamel portion is polished and the root gum portion is a satin diamond sparkle finish. 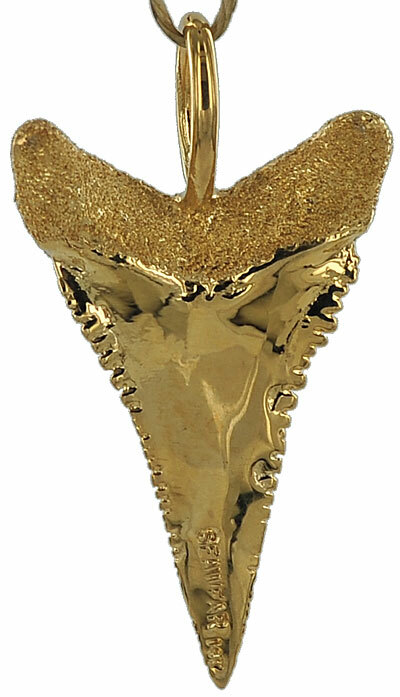 This is a large tiger shark tooth on a standard business card. 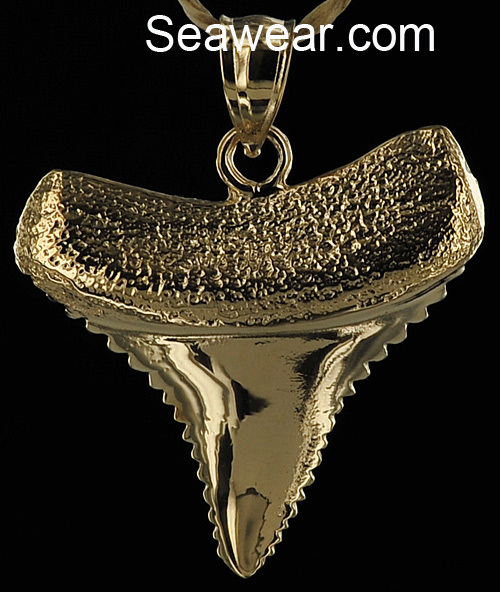 Great white monster shark tooth! At 26.6gms it is nearly an ounce. 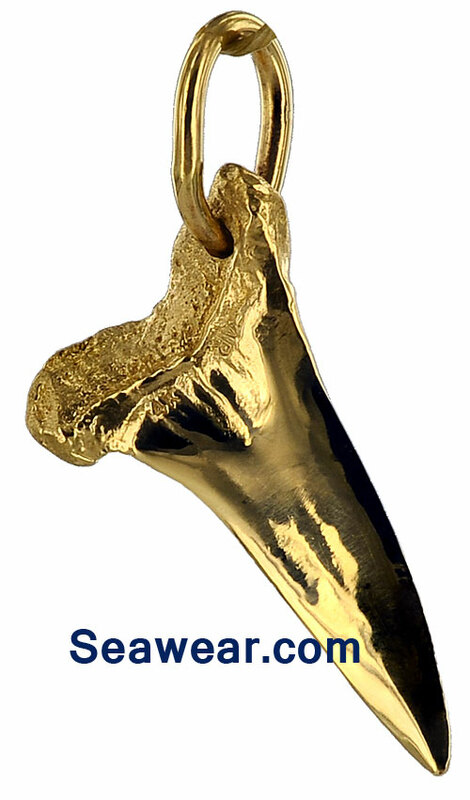 In 14kt it is $2,500ish. 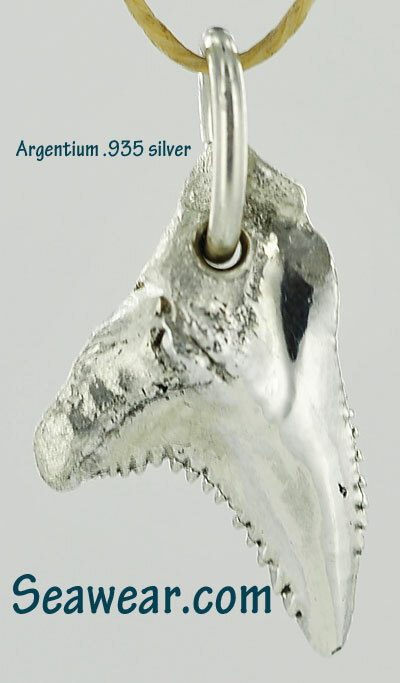 This is Argentium .935 silver. From the left hand corner to the man tearing tip is 46mm or just over 1.75 inches. 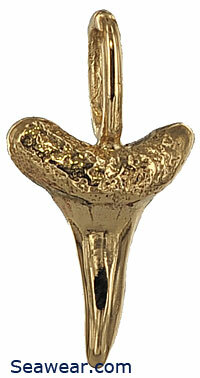 Including the built in fixed bail it is 53mm or 2 1/8" as that is the dangle length. 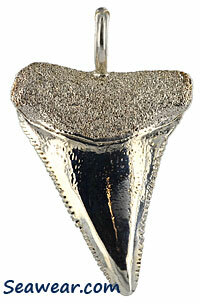 This is molded from a pre-historic fossil shark tooth, megalodon. 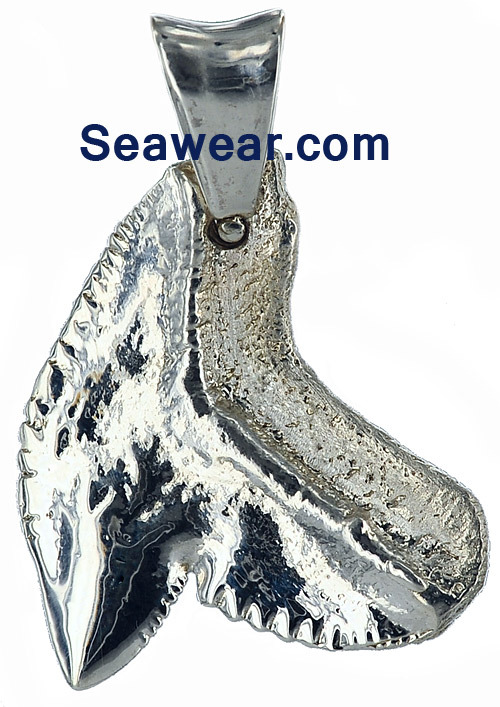 We have maintained most of the accuracy with age lines and fissures to keep the mass and weight as high as possible to the original. 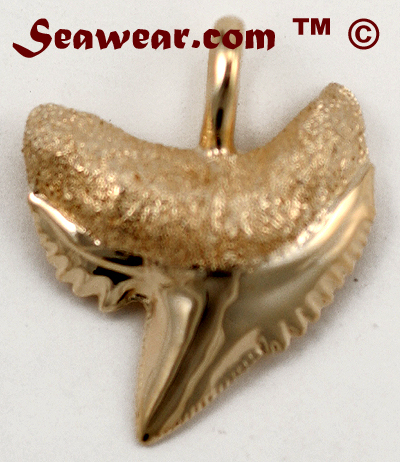 If you are on a pc and not a phone, this image will show extreme detail of the megalodon great white shark tooth jewelry necklace pendant! 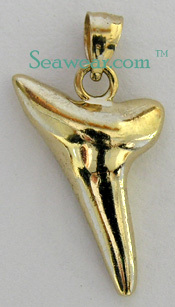 Bail opening is 5mm or nearly 1/4"
Great white shark tooth jewelry necklace pendant. This one weighs 21.5gms, more than 2/3 of an ounce. From the left hand corner to the tip is 1 5/8" or 41mm. 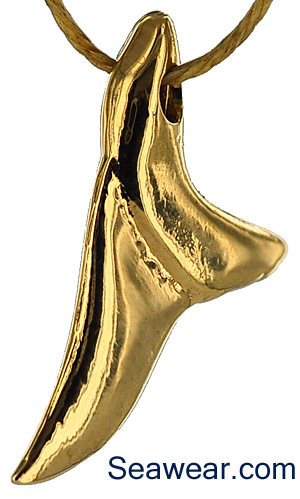 The total dangle length with the bail is just over 1 3/4" or 45mm. 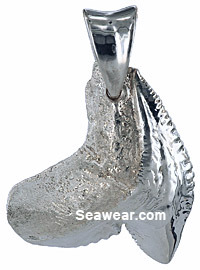 The bail is heavy duty, swivels and will accept up to 1/4" chain, leather cord or braided line. 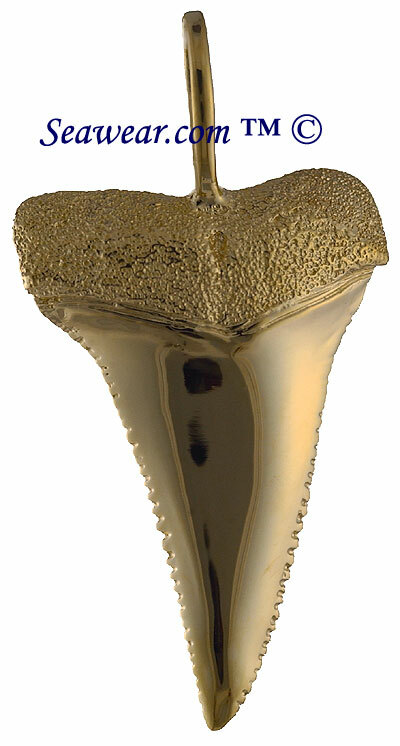 This tooth needs something strong. 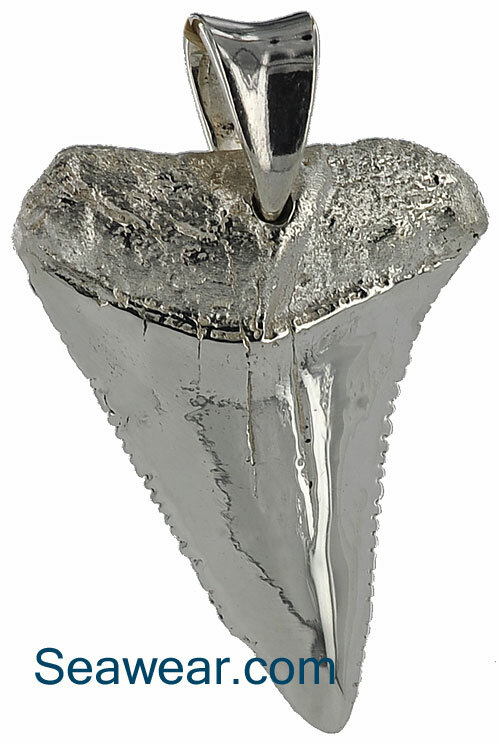 All the original crevices, growth & aging lines and imperfections have been left intact in the shark tooth rather than polish them out. 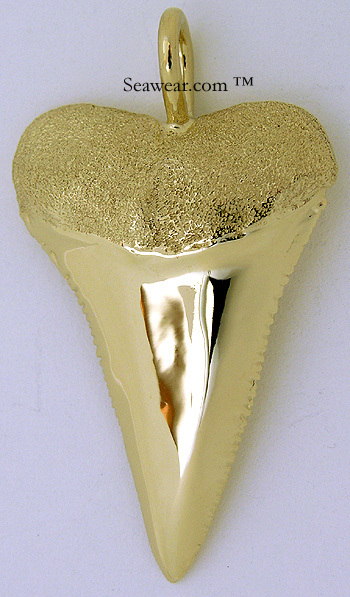 The enamel portion is polished and the gummed upper tooth is satin finished. The bail opening and entry hole for the bail pin has been polished, flared and beveled. Even on the back side. And if you choose to wear it with a black pirate t-shirt! 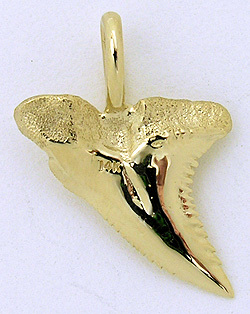 Tiger shark tooth pendant. This is a large and heavy one! 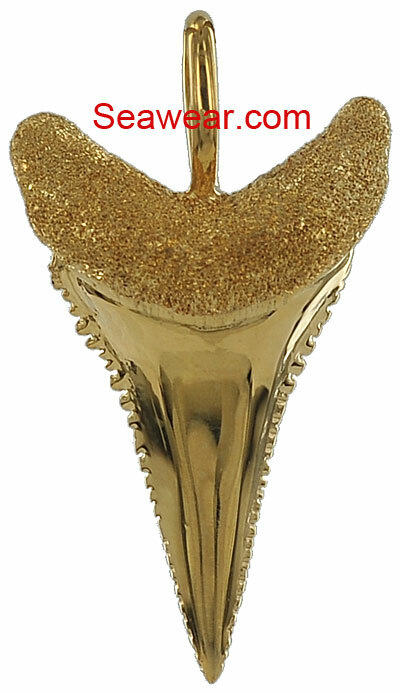 12.7gms The gum portion has been satin finished and the enamel portion is highly polished. 1 1/8" without the bail.Just the way it hangs. This is rather thick at 1/4". Every natural line, grain and pore has been left within the tooth. This is full round, 3D solid and does NOT have the back scooped out. 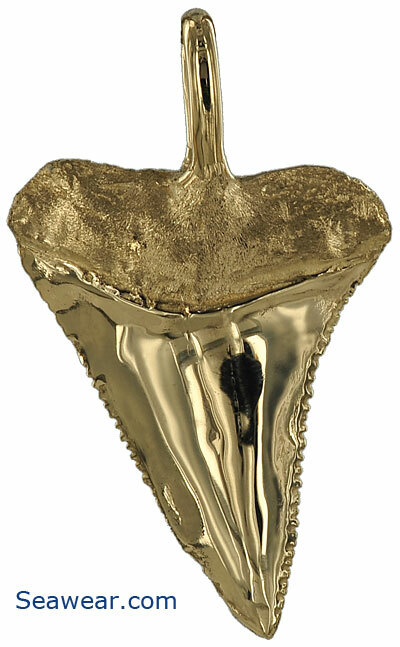 Each of these are unique and the image will change as the tooth sells and a new one is made. 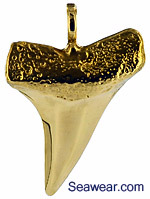 Tiger shark tooth ready to rip and tear in a frenzied pool of red. Solid 3D, app 7gms. 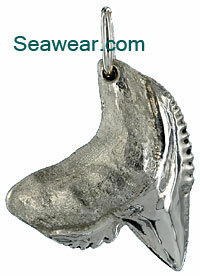 1" tall along right side, bail opening for up to 4mm chain without rounding. 3/16" at thickest point. 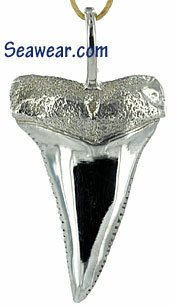 All high polished with the gum then detailed with a diamond bit for matte and sparkle contrast. 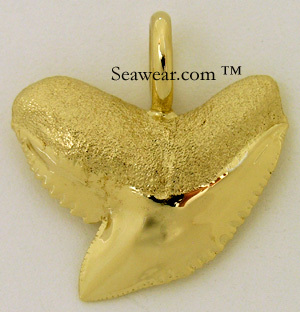 Wear it on a charm bracelet, anklet or necklace. 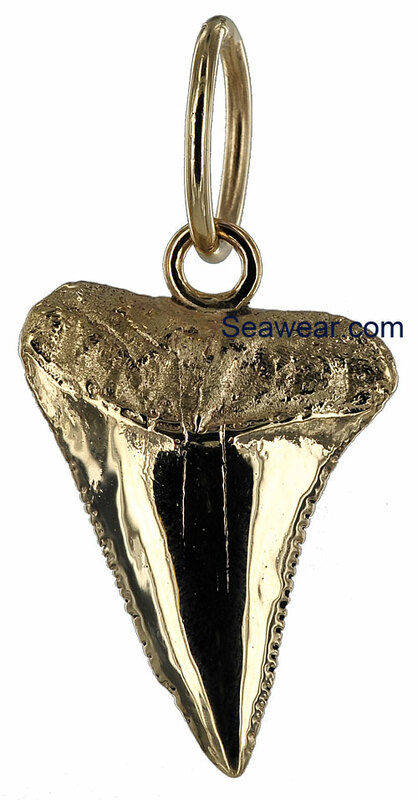 Great white shark tooth medium sized jewelry pendant. This one weighs app 10gms, the bail does not swivel and is cast as part of the tooth. From the right hand corner to the tip is 1 5/16" or 34mm. 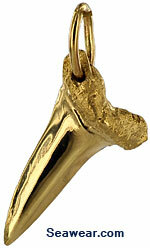 The total dangle length with the bail is just over 1 11/16" or 43mm. 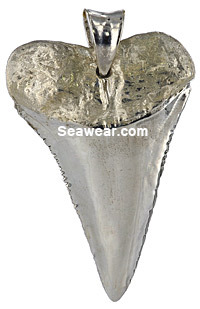 The bail opening is 1/4" or 5mm. This is 3D full round finished on all sides. This is all polished and we can satin the gum or tooth if you wish. 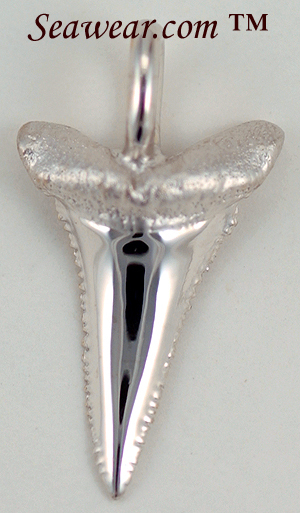 This has .935 argentium silver, more than .925 sterling silver.